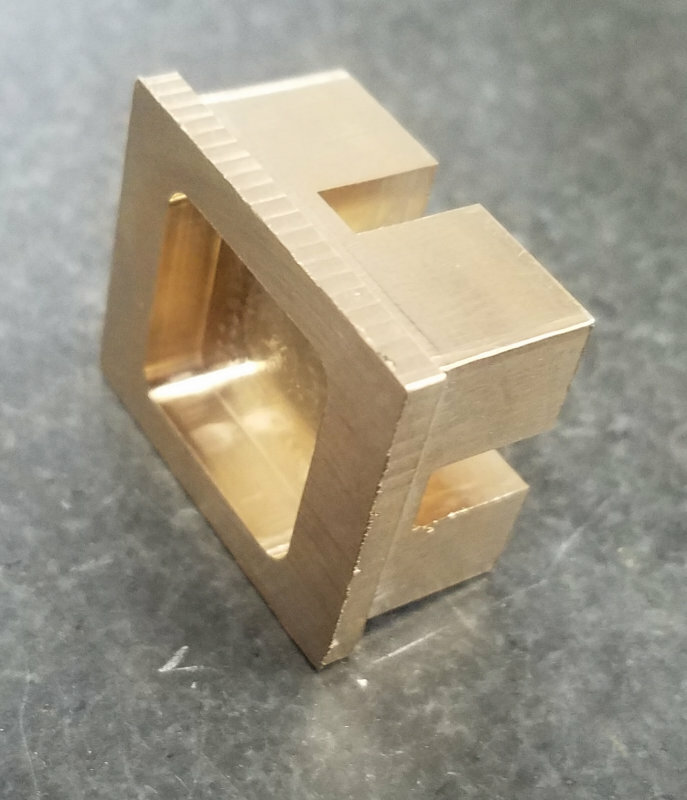 For JB-Welding on the test blocks, did you need to rough up the surfaces to get a good bond? I've used it for fillets and things, not for something holding pressure, any tips? I am really liking the powder coating experiments as well Kirk. It just seems more durable than paint when done properly. Of course the engine is looking fine too!! For the test pieces I did use a bit of 180 sandpaper before applying the JB. I'm going to start powder coating parts, esp, the bottom-most ones so as to not have to disassemble everything later. 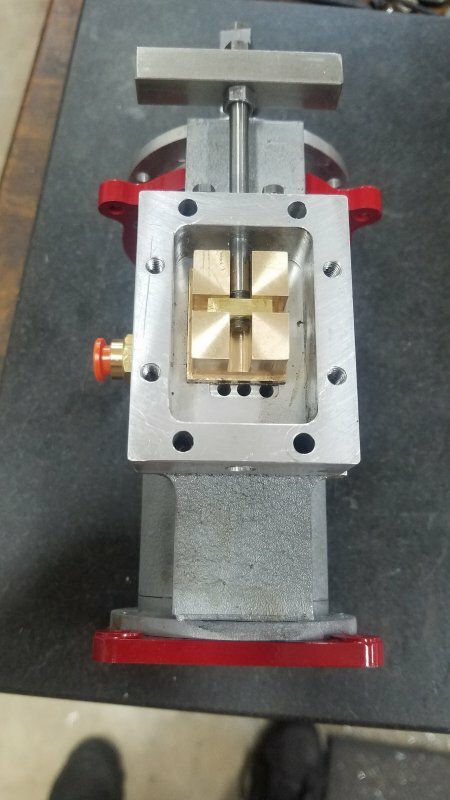 In addition, I need to get the cylinder, its flanges, and the port block bonded permanently. 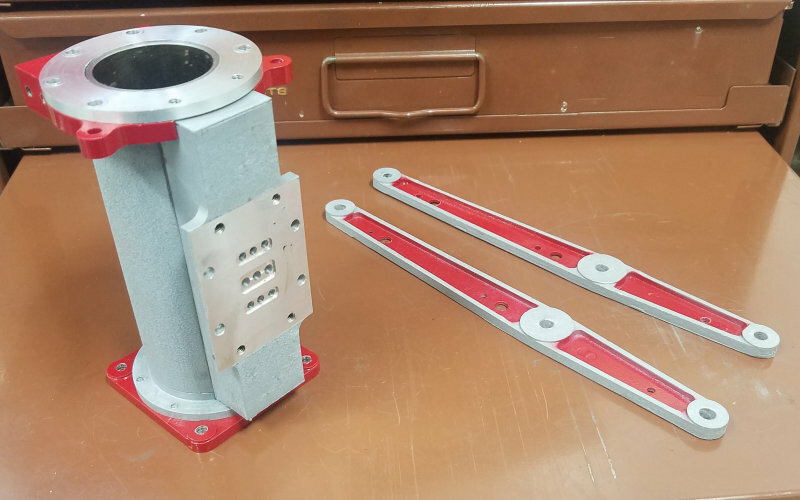 Before the top flange can be permanently attached, I need to powder coat all parts of the assembly, and as well the beam collar needs to go on as it can't be removed afterwards. 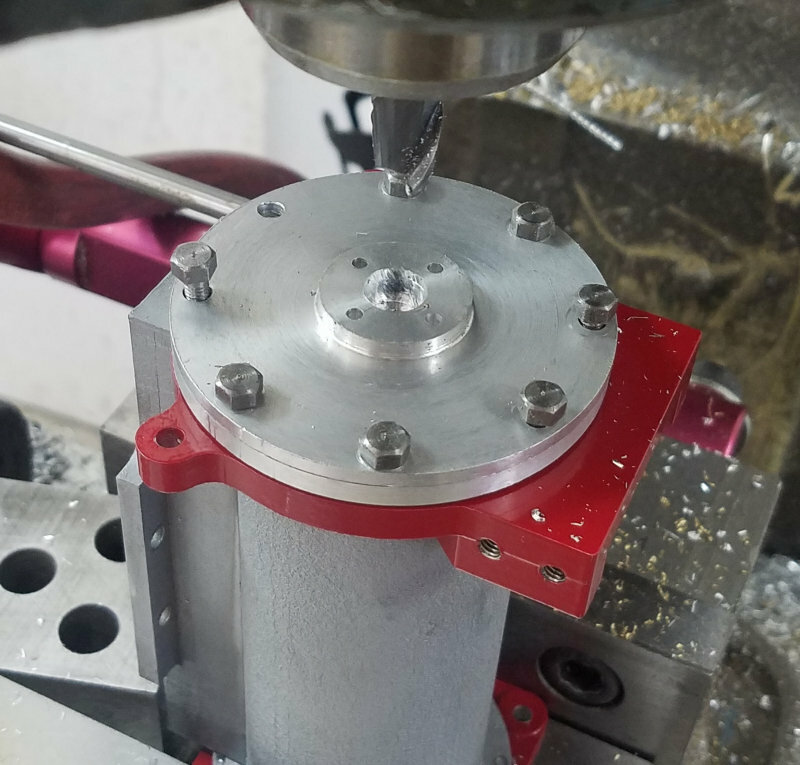 First stage is to loctite the bottom flange to the cylinder. Everything in the engine depends on alignment along the centerline. 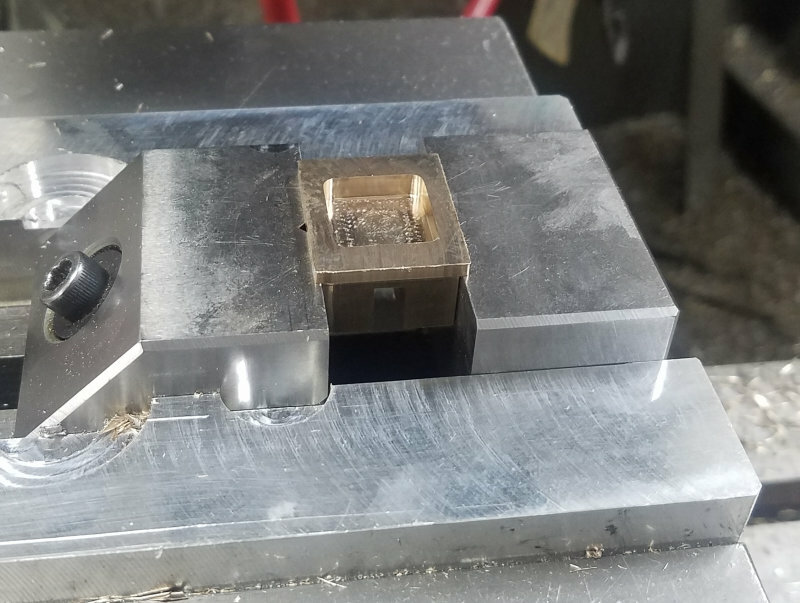 Since the cylinder mounting plate is made square to the base, I use that to align the port block face as shown here. Once cured, the loctite should withstand the 400F temp needed for powder coating. On another note, I whipped up a piece of scrap aluminum and used it to clamp the base to this sine table (7/16 threaded holes in a 1.25" square pattern. I bought this table years ago quite cheaply but have never used it until now. The table will serve two purposes. One is to clear vertical space for a flywheel before the actual sub-base is built. The second is to allow The crankshaft to be chucked in lathe jaws for some running in without needing to shim the base. I haven't posted for a while thanks to some computer issues, but have done some work on the engine. Here's some parts after powder coating. 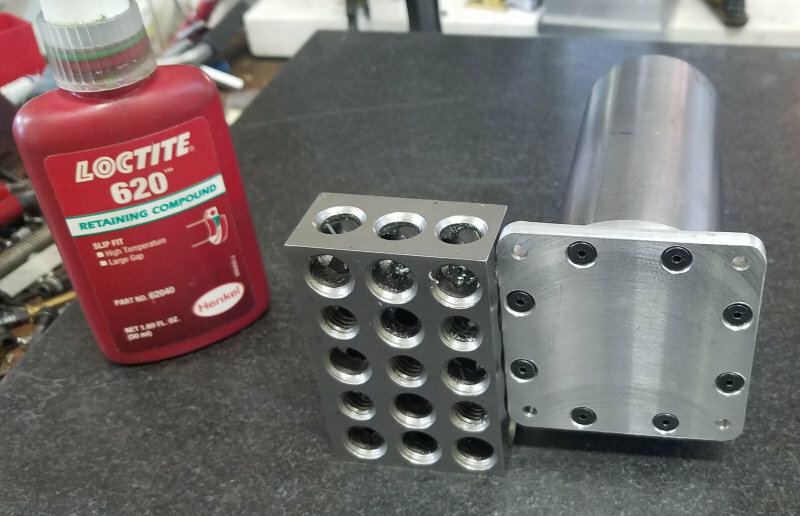 I have subsequent to this pic glued up the post block to the cylinder using JB Weld, and then the top flange with 620 loctite. I attached the steam chest and its cover, and then blocked the top of the cylinder before applying air. No major air leaks seen around the joints. 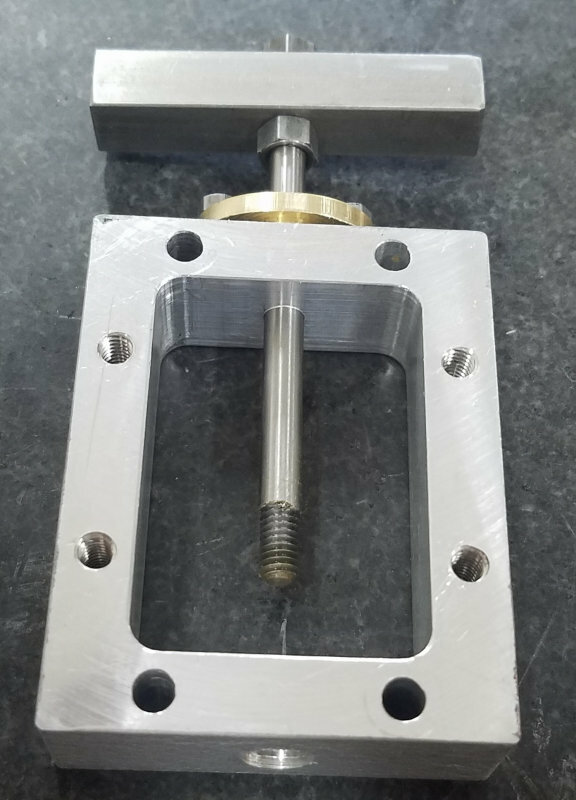 Today's project was machining the valve. I used Julius' overall dimensions but went with the cross slots and nut for retaining the valve rod. First op was facing some 2" bronze rod on the lathe. 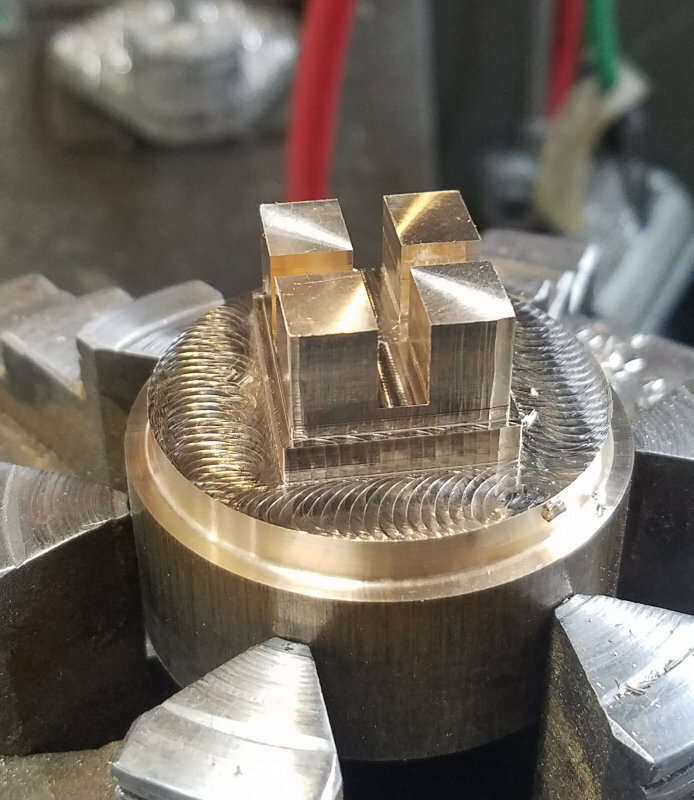 Turning down the diameter a bit was to provide a bit of extra relief to the endmill in succeeding ops. The spotting drill dimple in the center was to aid in centering on the mill. 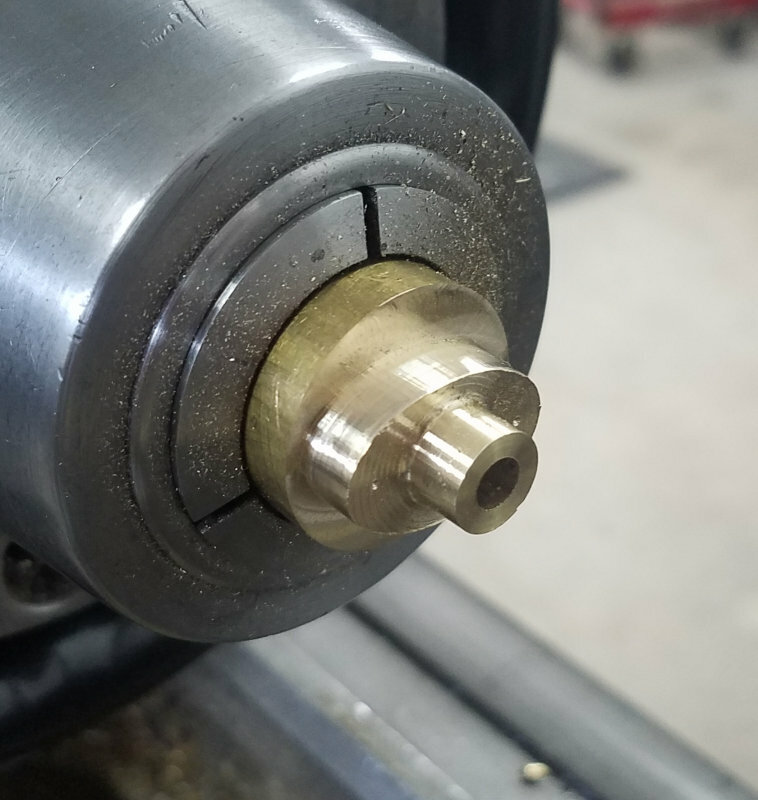 Given my owning a cutoff D1-3 spindle nose that matches my lathe, I can move lathe chucks with stock attached to the mill. Then use a wobbler center finder to zero on the dimple. 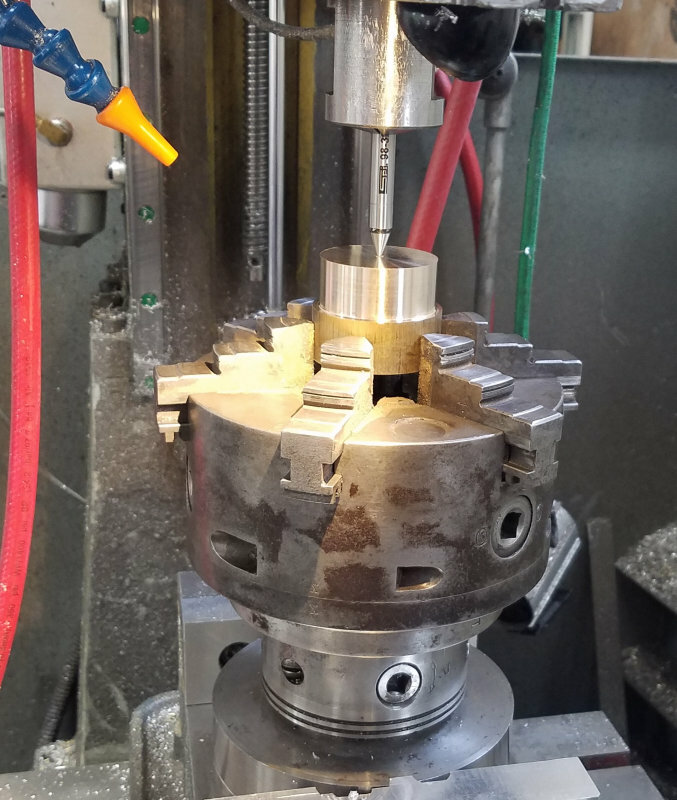 After returning the chuck to the lathe, I parted off the valve and moved it to the manual mill for removing the parted material and taking to the proper dimension. 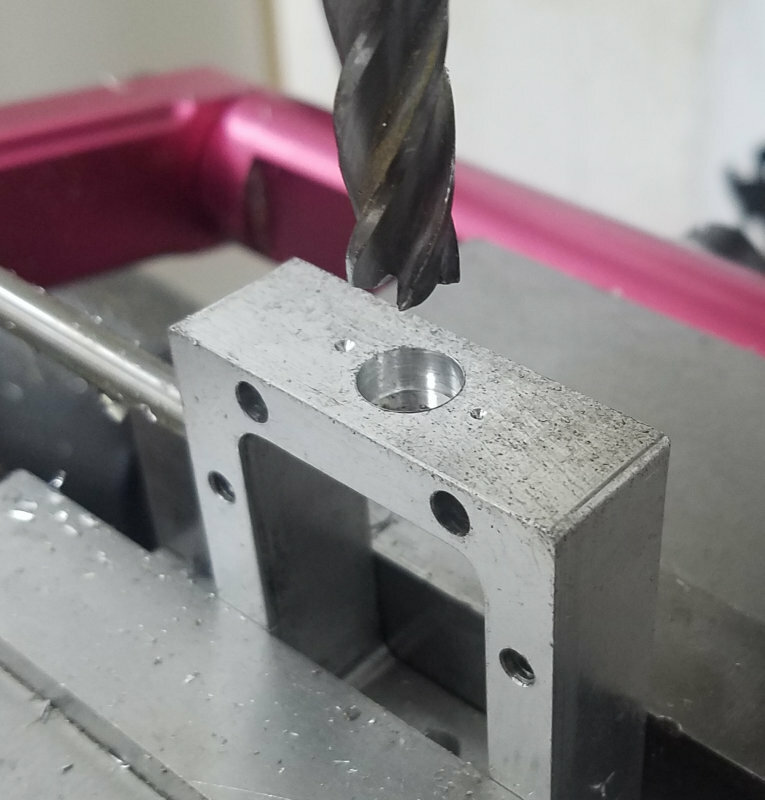 Then back to the CNC mill to machine the inner pocket using a 5/32" endmill. First project of the day was making the valve rod. 3/16" drill rod 3" long, with 1/4" of 8-32 thread on one end and 3/4" of 10-32 thread on the other. 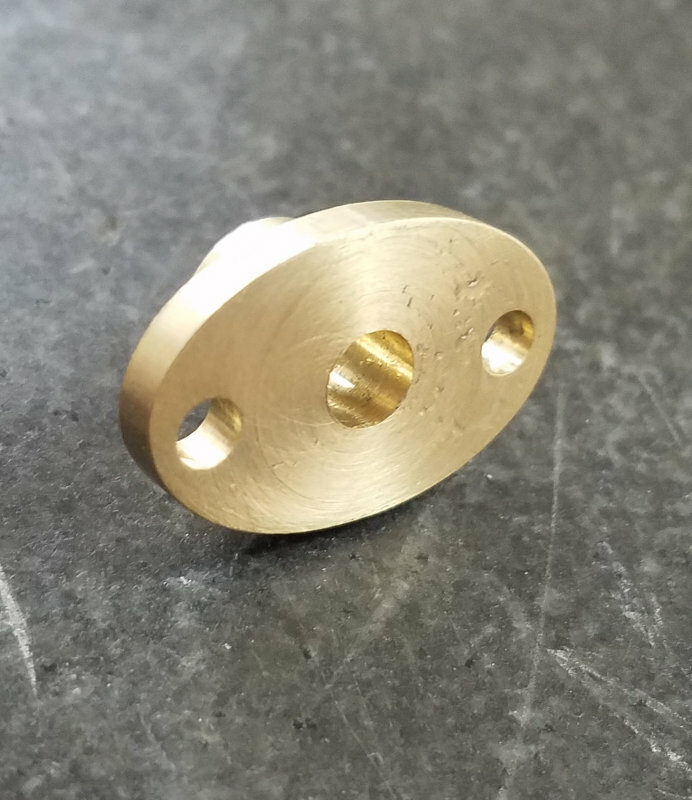 Then the valve nut from some 1/4" square brass rod machined down to fit the 4mm cross slot. Then finished drilling/tapping the steam chest. 1/16-27 NPT air supply hold for the bottom of the chest and provision from the gland at the top. The gland mounting holes are tapped 5-40. The gland itself is a project for next time. Beauty shot of the assembly. After the last pic I powder coated the outer faces of the steam chest to match the rest of the cylinder. The front and rear faces were left uncoated to facilitate a good seal to the port block and cover. Still watching and . Looking good! Good to see more progress on this one Kirk. The parts are looking great. Today's project was making the valve gland. 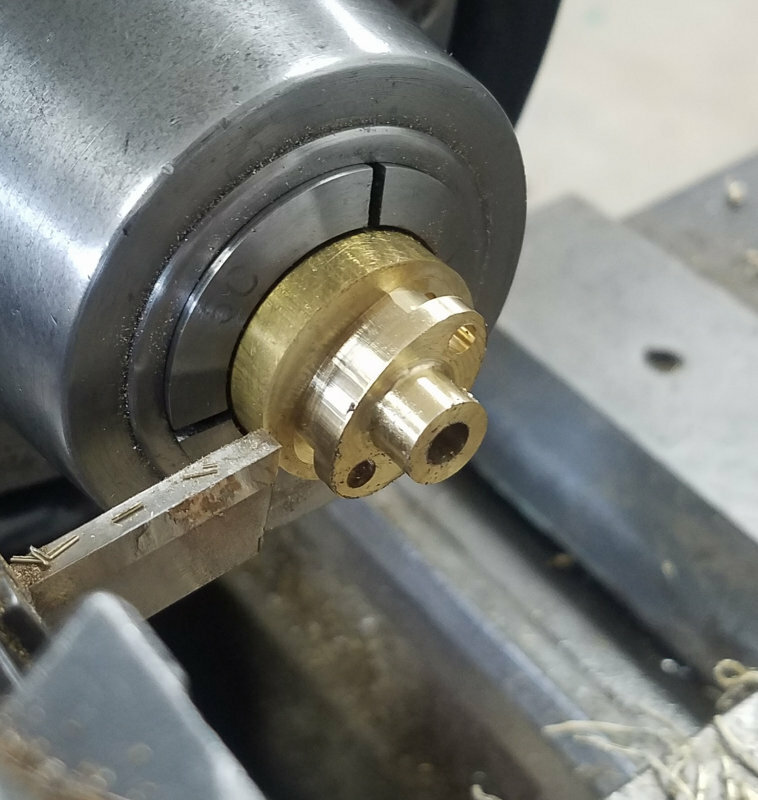 The outer profile fits within a 1" circle, so chuck some 1" brass rod in the lathe and carefully turn a 6mm spigot that just fits the matching 3/8" pocket in the steam chest. And the moment of truth seeing that with the gland mounted on the steam chest the valve rod slides smoothly. Always a good feeling when things fit (and slide) as they should. Nice looking gland!! Today I fabricated the gland for the piston rod. 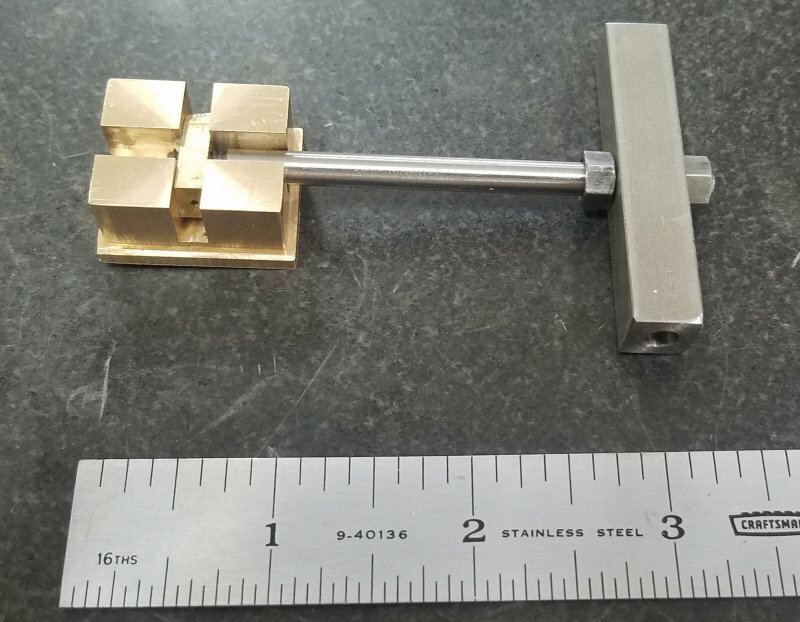 Pretty much the same as for the valve gland except the outer profile is round; this meant it could all be done on the lathe and manual mill from 1" round brass bar. Then I used a 25/64" endmill (obtained in a collection buy) to mill 7mm deep. 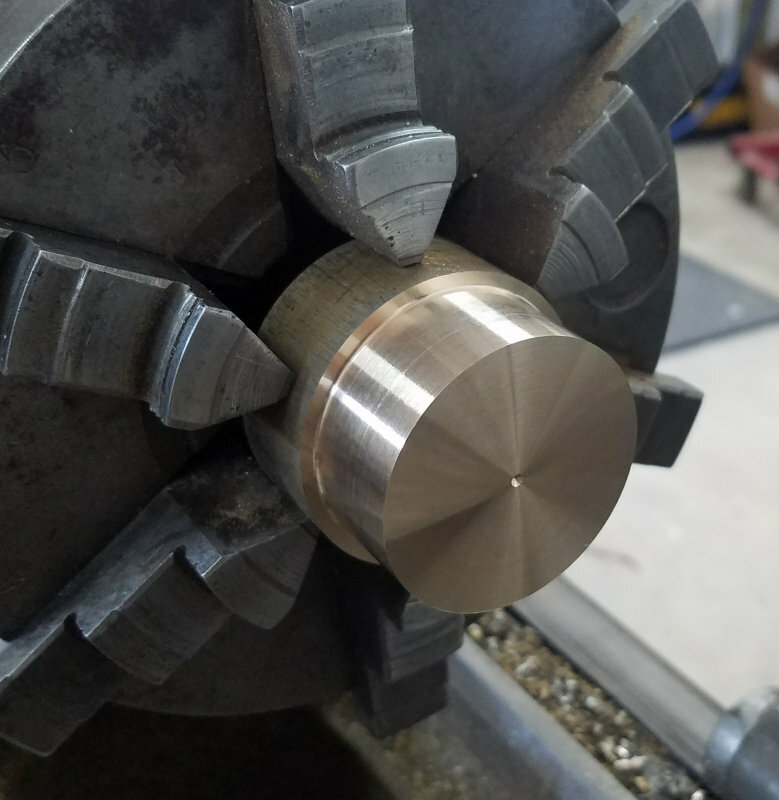 This resulted in more chatter than I liked, so I chucked it in the lathe to make a skim cut of the sides with a micro boring bar. 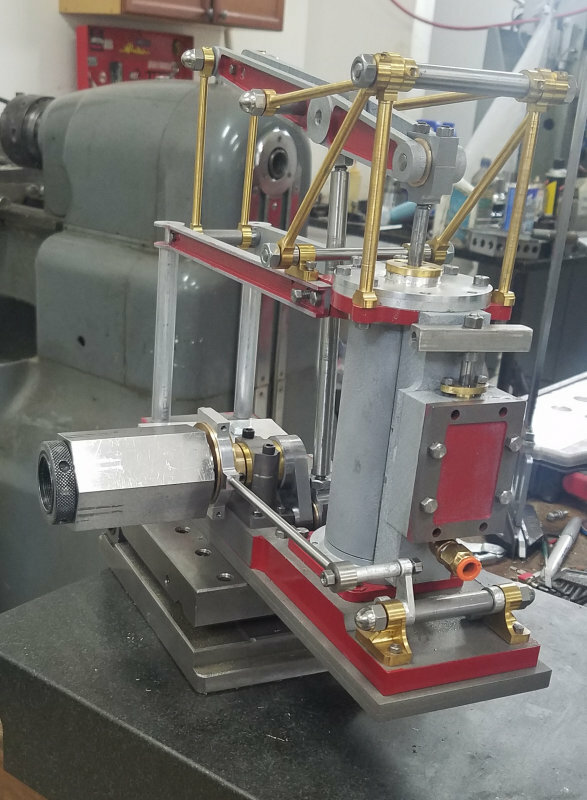 I was then able to assemble all the components of the cylinder to test for operation on air. Moving the valve rod with air attached moved the piston up and down quite briskly. I found almost no air leakage around the steam chest or the glands, but I did feel air leaking around the bottom. Inspection showed that the bottom flange had opened a crack where it mates to the cylinder body (via loctite). This is a bit worrisome as detaching it could pose a problem (I don't want to apply high heat to break the rest of the loctite bond. By clamping the crack disappears, so I'm thinking to disassemble and apply a new layer of powder coat in the area to seal it after applying more loctite into the opening. I had assembled all of the necessary parts except the valve lifters to see how well the entire set of mechanics work. 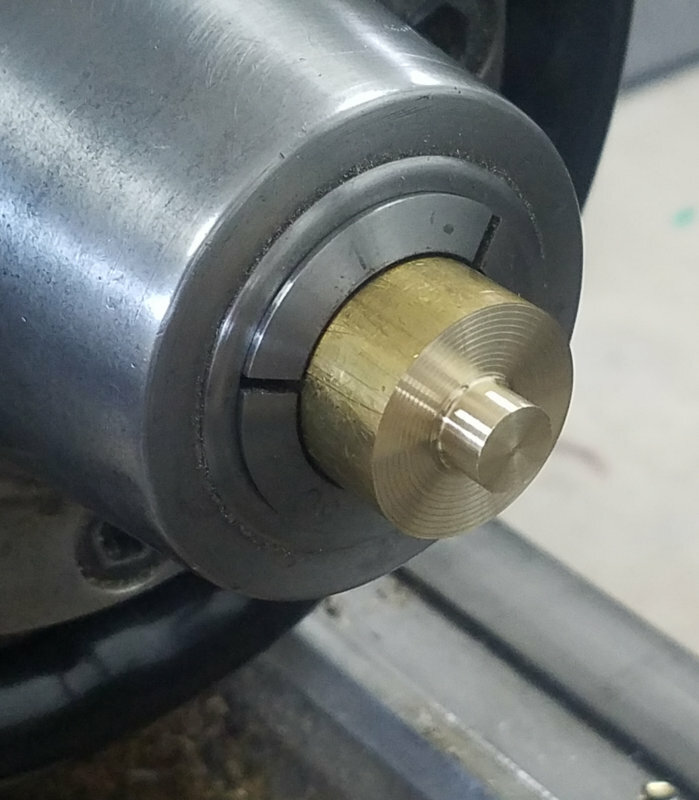 There is something of a dead spot when turning the crankshaft at the topmost part where turning it in either direction over about 15 degrees yields an imperceptible motion of the beam. I doubt that's cause of alarm. 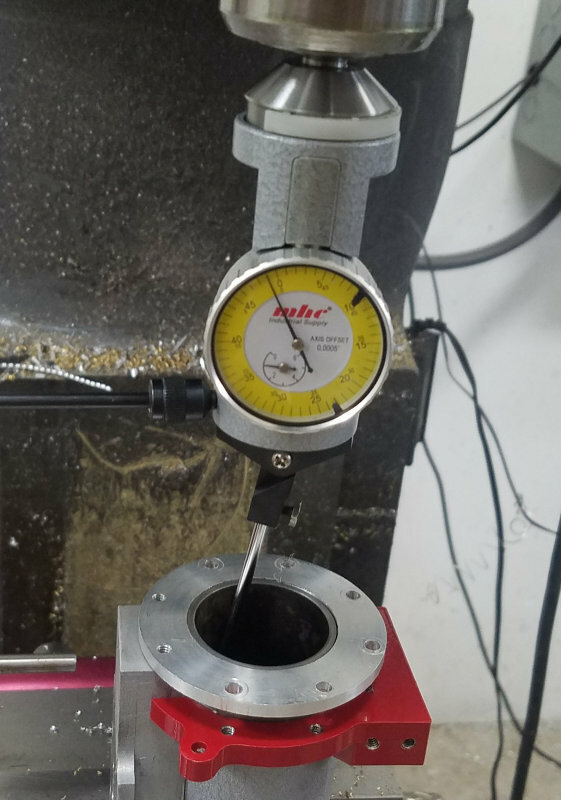 When I applied air, moving the valve rod caused no resulting movements of the piston rod. Examination shows that a crack had developed in the juncture of the port block and cylinder bonded by JB Weld allowing all the air to escape. I did a partial disassembly to free the cylinder and pried the port block free. Seems that the JBW adhered just fine with the aluminum port block and not at all with th steel cylinder. 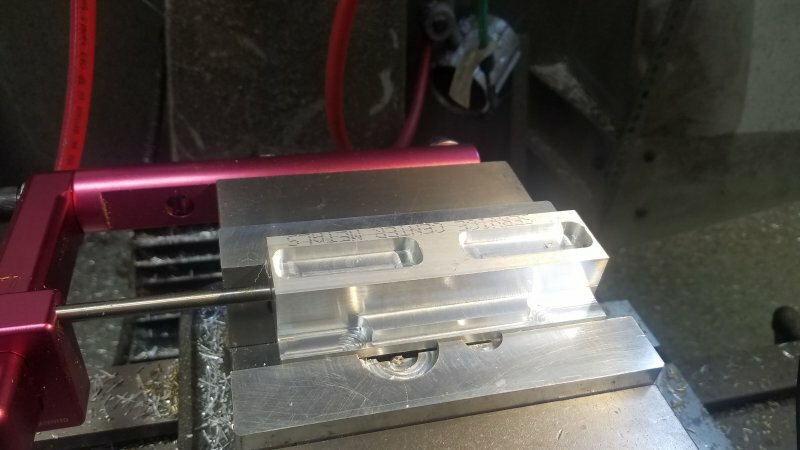 The fact that I did a second powder coat of the assembly may be the reason, although the powder coat temp is 400F and JBW is supposed to withstand 700F. I am going to remake the port block with a few improvements and try again, this time with Loctite. Some catching up on this thread. 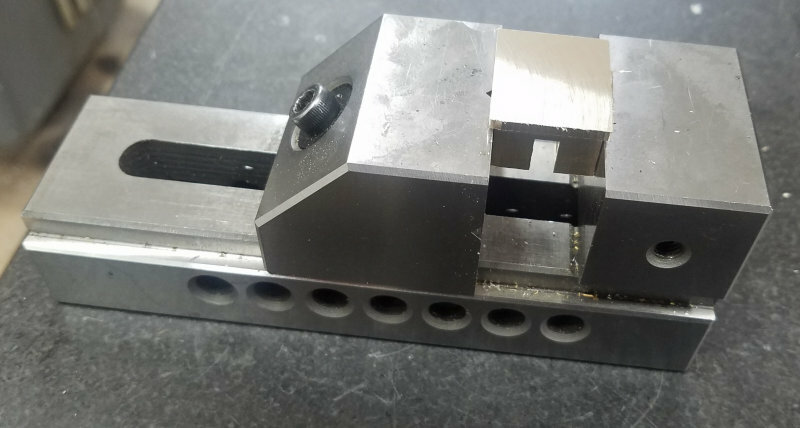 I decided to remake the port block, and this time I didn't let the inner air channel be open at the ends. I also sized the block so that it is a tight fit between the two cylinder flanges. After powder coat I used Loctite instead of JBW to seal the block to the cylinder. Reassembled, the engine mechanism turns pretty well using a 5C collet block to grip the end of the crankshaft in lieu of a flywheel. That was last week. Today I started on the valve "lifters". I previous tried to make them from 1/2" square brass, but machining them to thickness resulting in banana shape. So this time it's Mic6 aluminum. 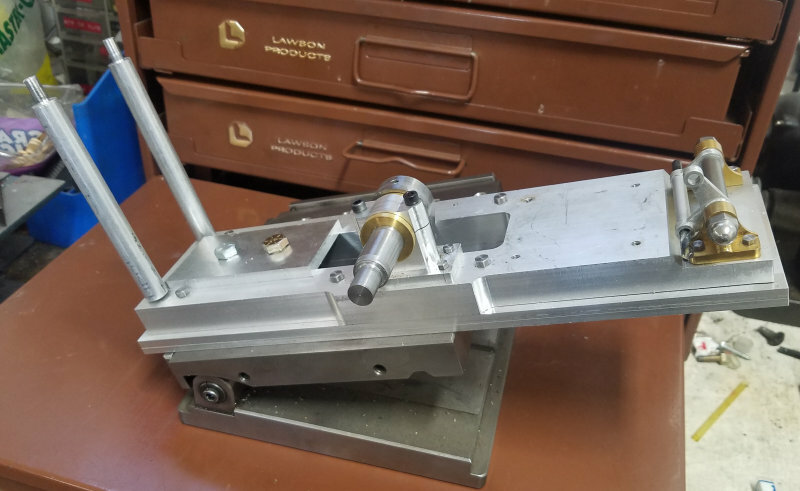 I now need to thread some 3/16" rod to connect the lifters to the valve assembly and eccentric levers.